Antonello da Messina’s meditative Annunciation of Palermo, Caravaggio’s Supper at Emmaus, Mantegna’s Lamentation and Titian’s Christ Carrying the Cross in one room with six other masterpieces sounds like Art History Heaven, but the new exhibit at the Vatican Museums, Divine Creatures, pleases not only the aesthetic sense but also the spirit. 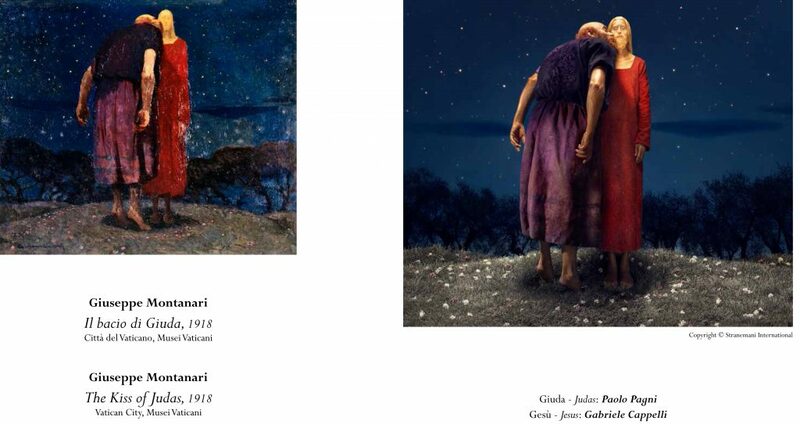 Inaugurated on January 22, National Sanctity of Human Life Day in the United States, the exhibit consists of 10 photographic reproductions of some of the world’s most beloved paintings with actors taking the place of the original artistic models. 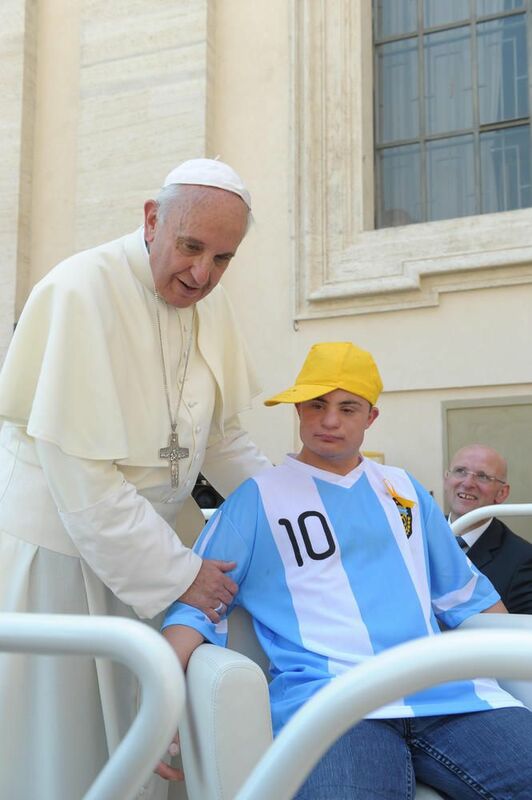 The young men and women, representing angels, the Virgin Mary, Christ or His disciples, were selected from members of the Italian association Noi … da Grandi, which assists disabled people and their families. 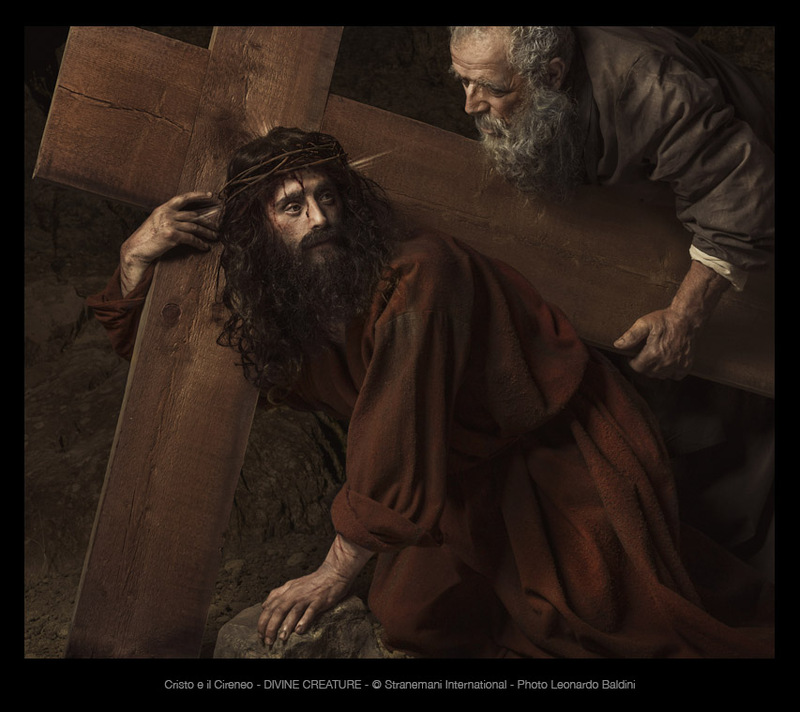 “I was meditating on a passage from Matthew’s Gospel,” said the creator of the exhibit, Adamo Antonacci, at the show’s opening in the Vatican Museums, “where Jesus cures a leper by touching him.” For the Florentine filmmaker, “that gesture was revolutionary; instead of condemning people for their disabilities, Jesus made them His focus.” So began an idea that he was initially “too embarrassed” to even suggest, but it gradually took root as a creative impulse that had to be brought about: the life of Christ told through famous paintings, reproduced with the faces and gestures of disabled people and their families. Antonacci selected 10 masterpieces by Titian, Caravaggio, Rosso Fiorentino, and other celebrated artists to be reproduced and photographed by Leonardo Baldini, whose extraordinary talents transformed these well-known paintings into new works of art. The project involved 45 people and took over 6 months to complete, but resulted in works of exceptionally high quality. It is precisely the professional skill and the technical mastery that firmly places these works in the realm of art, as opposed to what many feared might become a condescending exercise in saccharine piety. To produce these photographs, Baldini worked with each actor individually. Instead of composing the group and hoping for the perfect shot, he allowed each model the time to grow comfortable with the character, and then later assembled all the figures in post-production. Caravaggio used the technique 400 years ago to achieve his theatrical effects, and the perfection of the surface details and the evocative plays of light recall the Lombard master who has two works reproduced in the exhibit. The wigs, costumes, make-up and props were meticulously prepared to match exactly the textures and colors of the original works. Some are displayed in the exhibit next to the photograph, along with pictures of the meticulous preparation required for each shot. The actors, however, several with Down syndrome, add a poignant nuance to the works. The exhibition starts with Antonello da Messina’s Annunciation of Palermo with Sara Cianca as the Blessed Virgin. 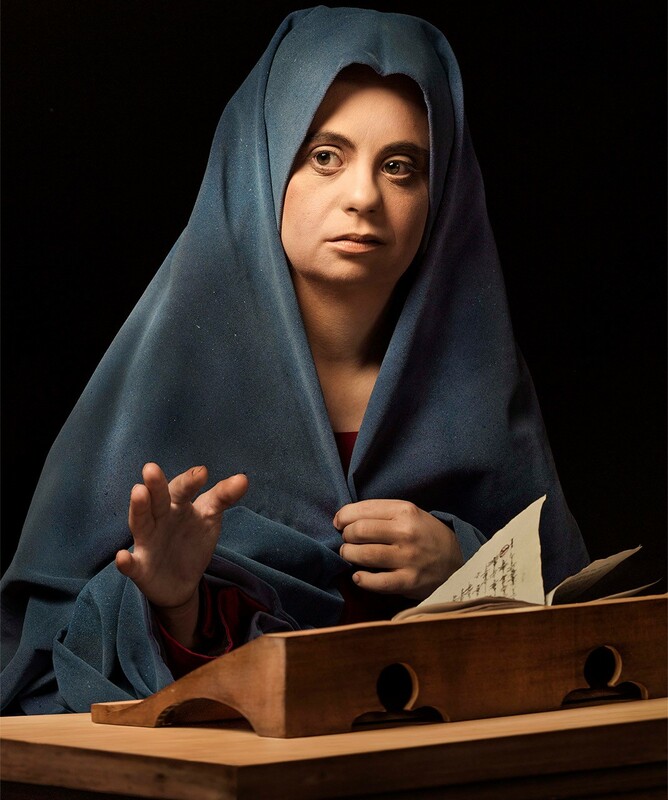 Mary’s reaction to her special calling takes on a particular meaning looking at the large eyes of the young woman, who is also living out an extraordinary vocation. Gerrit Van Honthorst’s glorious Adoration of the Child is arguably even more beautiful than the original with the radiant faces of Benedetta Silvestri and Rebecca Certaldesi, whose joy appears natural and spontaneous before the luminous Christ Child. When Jesus falls under the cross in Titian’s painting of Christ and Simon of Cyrene, the youthful innocence of Gabriele Cappelli’s visage evokes the innocence of Christ. Most of the chosen works were painted in the Renaissance and Baroque eras, the moment when nature and humanity, elevated by great artistic talent, inspired the most unforgettable masterpieces. Leonardo Baldini’s exquisite form paired with the rich content brought by these actors, transform these oft-viewed images into new works of art. The exhibit debuted in 2017 at the Museo dell’Opera del Duomo in Florence headed by Msgr. Timothy Verdon. The newly named director of the Vatican Museums, Barbara Jatta, attended the opening and immediately thought, “I must absolutely bring this show to the museum of the pope.” The Vatican version of the exhibition added one more special treat to the mix: next to the photograph of the The Kiss of Judas hangs the original 1918 painting by Giuseppe Montanari, kept in the papal collection of Modern Art. It is not the first time an artist has thought of recasting famous works of art with people with disabilities. In 1998, Raoef Mamedov, an Azerbaijani director and artist, reproduced Leonardo da Vinci’s Last Supper with Christ and the Apostles played by people with Down syndrome. The work stirred a great deal of controversy, yet Leonardo da Vinci was known for seeking out the most interesting faces in the crowd to enliven his paintings. Many of Adamo Antonacci’s models were at the opening, delighted to have participated in the project, and their proud families basked in the joy of seeing their brothers, sisters, sons and daughters immortalized in the most iconic images. The presentations at the opening of the show emphasized a reoccurring theme of bringing disabled people out from “behind the curtain.” The Vatican Museums has placed these works in the foyer of the museums where visitors can come and enjoy them free of charge until March 3, 2018. The Divine Creatures exhibit will be the first works to greet tourists on their way to the Sistine Chapel, awakening them to the inherent beauty that is part of the dignity of all human beings.